The clients were a retiring couple, relocating to the West Coast following professional careers in the Midwest. Their children had already established their lives outside the family's home. As a result, the McAndrews desired a spacious informal new home for small scale entertaining as well as quiet time together for reading and study. 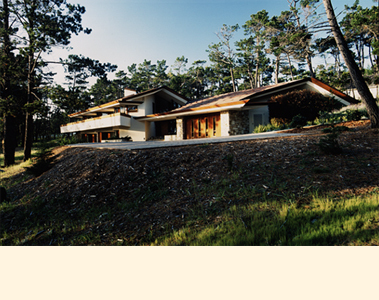 The residence was placed within an evenly sloping one acre site containing attractive massings of mature Monterey Pines. The McAndrews Residence is two levels arranged as a linear sequence of spaces angled against the main axis and sheltered by a single enveloping gable roof. Both floors are linked at the mid-level entrance foyer, a generous light-filled volume surrounded by the dramatic interplay of pitching roof planes and of light and shadow. The entrance foyer is flagstone paved as well as landscaped; both extend well beyond the glazed wall of the residence to form an inviting garden between the house and two-car garage. The Main Floor contains the activity spaces of Living Room, Dining Room and Kitchen linked under the expansive cathedral ceiling. The spaces all open onto a southwest facing deck, looking over the tree-filled lot and to the view beyond. A massive stone masonry fireplace provides the focal point for the Living Room; a triangular portion of the southwest roof plane projects beyond the ridge to the chimney and forms a patterned clerestory window opening. The Lower Floor contains the Master Bedroom and Bath, an Office/Study and Guest Bedroom, all of which open onto a ground level terrace that faces southwest. The McAndrews Residence is wood-framed, primarily stucco on the exterior and painted gypsum board interior with wood trim of either redwood or oak. "Carmel" type stone masonry is used both inside and out. The roof is sheathed entirely of copper. The clients requested that Aaron Green design and/or select all furnishings for their new home, choosing to liberate themselves of their lifetime collection prior to starting a new California lifestyle. The residence, sheltered parking and accessory storage enclose approximately 4,200 square feet.